What does "intuition" conjure up in your mind? There are so many ideas as to what this is. For some, it's some strange phenomena that "psychics" have. For others, it's a mysterious experience that comes out of nowhere, where some flash of insight guides them in some way. Me? I believe that everyone is intuitive. You just need to learn how. And maybe expand your idea of what intuition is, and how you access it. 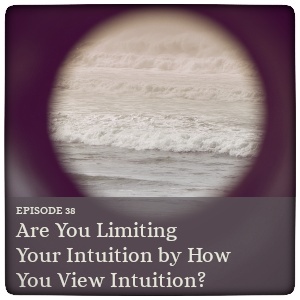 How your idea of what intuition is might be limited… or limiting you in certain ways. The two levels of "intuition." A more empowered way of thinking of intuition. How you understand intuited information (how you make sense of it all). Those flashes of insight you might have and how to work with them so they start to make more sense to you. When you want to follow the intuitive flashes you have and when you need to work more deeply with them. Working intuitively to get answers around the big questions you have. Not where you have to wait around for that flash of lightning to drop some intuitive knowledge your way, but how you step into your power and go get that information, using your beautiful intuition as a guide. So let's talk about how *you* think of intuition. I'll share how I see it, and how I work with it. And how you can too.